Who is the Pittsburgh Steel Man? 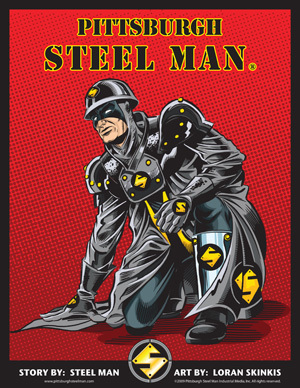 Steel-Man® is Pittsburgh's Official SuperHero and the Only Real Man of Steel. 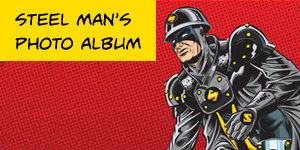 Look for Steel-Man to bring to your city the most unique Comic Book Artwork and Stories ever. Also, when Steel-Man comes to your town for a Pop Culture and/or Comic Book Convention, expect the best show and artwork this generation has seen since the silver age of comics. 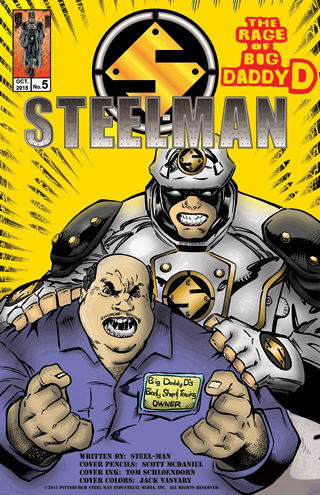 Remember folks, the Steel-Man Comic Book Series is Pittsburgh's Greatest Comic Book Series ever created and is inspired by Real Life Events. 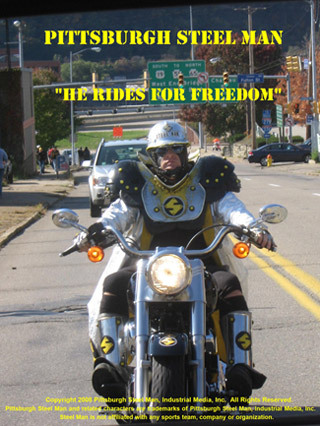 The Real Life Adventures: Pittsburgh SteelMan is Pittsburgh's Official SuperHero who represents the past, present and future pride and glory of the town he loves. 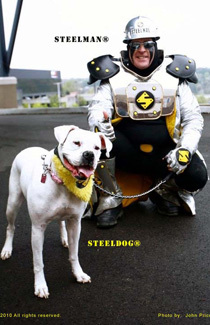 Steel-Man and his trusty companion Steel Dog® are a Pittsburgh man/dog hero team that enjoy representing the Steel City. 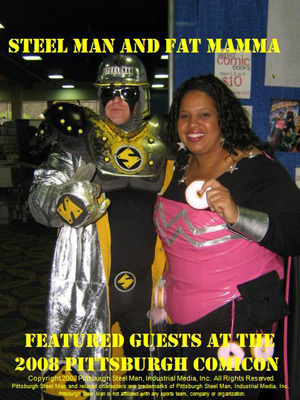 As a result of their many appearances at local and national events, SteelMan and SteelDog have become a Pittsburgh and national sensation. 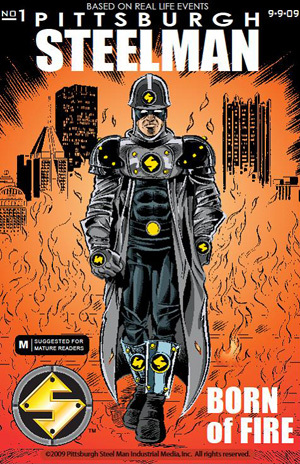 SteelMan's unique costume is inspired from the actual uniforms used in Pittsburgh's steel industry. The suit consists of what are called "silvers" which are aluminized flame resistant apparel used when steelworkers get close to molten metal. 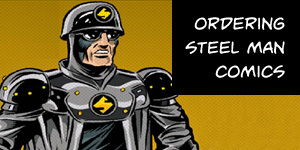 Both Steelman's and Steeldog's exploits are chronicled in their very own Comic Books, Coloring Books, Children's Books and Newspaper Comic Strips. The Story:The Steel-Man Series is like no other comic series you will ever read because it is based on real life events and there will be a level of controversy never before seen in graphic novel media. The Steel-Man Series is written by Steel-Man and promises many twists and surprises that will culminate in an ending you'll never forget. Steel-Man is "The Only Real Man of Steel" and his comic series illustrates the life of a Real Life Anti-Hero in a city that has two faces. The Steel-Man will tell his story from his perspective and the reader will be free to judge the truth not told to Steel City and hid from the people. Read the story that the Pittsburgh media could not or would not ever tell – Read The Steel-Man Story. This story is not like any other you will ever read because, unlike all other comic books that you have read, this is the story that the Steel-Man never wanted to write . . . but he had no choice . . . The Steel-Man Series is Rated T for Teen. And, if you want to try something truly unique, then read The Next Great One which just so happens to be a Pittsburgh Based Original Series and is based on "Steel-Man, The Only Real Man of Steel". 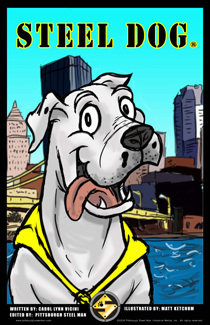 Children's Books: ecause of Steel-Man's immense popularity with the youth of Pittsburgh, the Steel-Man has teamed up with talented local "Disney Style" artist Marc Baker to create, "The Adventures of Steel Dog" Series. 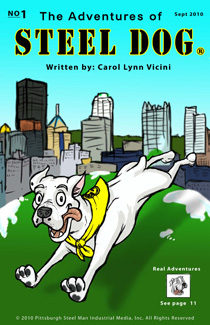 The story is written by Carol Lynn Vicini and edited by Steel-Man and published by Pittsburgh Steel Man, Ind. 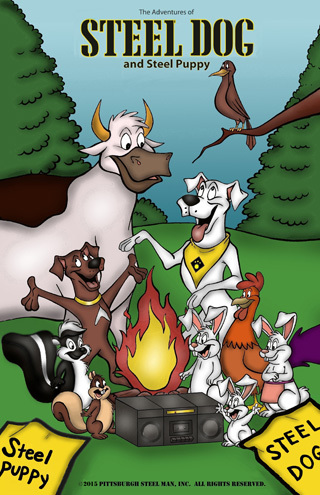 Media, Inc. Look for new issues of "The Adventures of Steel Dog" and please purchase our many unique products which include comic books, coloring books and children's stories about "Steel Dog, The Only Real Dog of Steel" and Pittsburgh's Official Mascot Dog. Steel Dog: A 3 year old white Boxer who loves to meet the public and spread cheer. Steel Dog is immensely popular with the children. Steel Dog is the perfect complement to SteelMan's boisterous disposition. 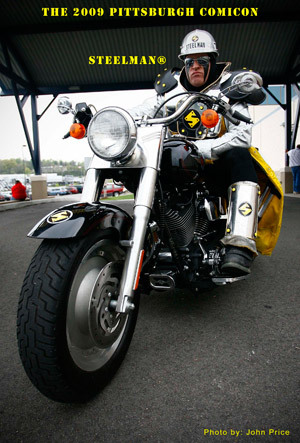 Sponsorship: Hurry to have Pittsburgh Steel Man sponsor your hometown product. And remember folks, "Be safe, think safe and be on the lookout for others". Site programmed and maintained by Kirk Peters Web Multimedia Studio. ©2013 Pittsburgh Steel Man, Industrial Media, Inc. All Rights Reserved. company or organization. Unauthoriced reproduction of this website or contents is prohibited without written permission.